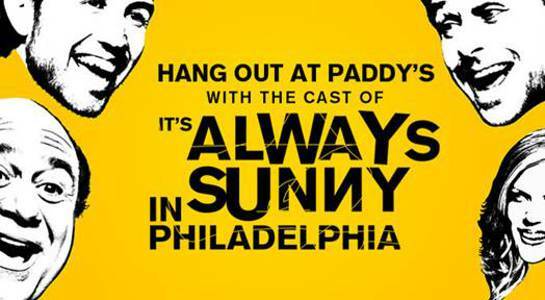 Omaze and the cast of “It’s Always Sunny in Philadelphia” are teaming up to offer one lucky winner and a friend the chance to be flown into LA to visit the set, hang with the cast, watch an episode of the hit show, and of course, grab a drink at Paddy’s afterwards. As the show has been deemed part of Entertainment Weekly’s “25 Best Cult TV Shows from the Past 25 Years” and infamously described as “Seinfeld on crack,” it’s no secret that time spent with Charlie (Charlie Day), Dennis (Glenn Howerton), or Frank (Danny DeVito) will be unforgettable. The winner and their friend will learn how “The Gang” came to be, what it takes to launch and star in a hit comedy, and what it’s like to indulge in a little happy hour at an imaginary bar with real people. Roundtrip airfare and hotel arrangements are included, so all that is needed is a love for Los Angeles and a sense of humor (assuming some heroic efforts, wisecrack jokes, and Hawaiian shirts are included on set). The best part about this experience is that every entry helps the Wounded Warrior Project empower veterans recovering from combat wounds. Enter HERE by September 20th for your chance to win!